The Intuos range is intended primarily for graphic design professionals. If you’re unsure about that, then the relatively high price of the unit should convince you. It’s expensive, but is it worth it? Among the features of Intuos tablets are what Wacom calls ExpressKeys on both sides of the tablet: buttons that reproduce the Ctrl/Cmd, Shift, Alt/Opt, Space and zoom in/out controls. 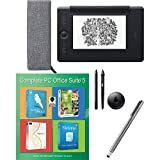 Except to enter text, a handwriting recognition module is integrated, the tablet can be used autonomously throughout work on a drawing, or photo, to draw a straight line, move the sheet, zoom on detail to touch up, all this without using the keyboard again. Its default settings suited us very well: for our drawings, our variations on the pressure and inclination of the pen had a perfect impact on the screen. This proper handling, better than the others, is found in particular in handwriting. Here, the writing reproduced on the screen is ours, and its automatic recognition is perfect, without the slightest error. This is not the case on more affordable models, which are obviously less accurate than this expensive model. Nevertheless, despite the effectiveness of the system, we stick to short paragraphs. The rubber also works perfectly and the pressure on it affects the width of the erased lines. There’s not much to adjust, just the basic settings of the stylus and eraser were fine with us. We are in dual screen: by default, the tablet matches both monitors at once. We preferred to confine it to a single screen; we gained in precision in the drawings even if the mouse became essential again. We advise you to buy a protective cover if you move it: without it, it will quickly get damaged. It is a more expensive tool than the many other models out there, but this one is definitely more suitable for professional use. The sensitivity to pressure, inclination, range, and fineness make it a really practical tool, which comes to be used as naturally as a mouse. Note: the Special Edition version is a little more expensive, but with the airbrush.